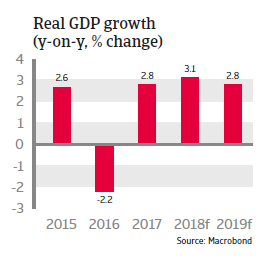 While the return to more market friendly policies has improved Argentina´s medium- and long-term growth prospects, significant downside risks remain. President Mauricio Macri has addressed the important economic issues left by the former government (e.g. debt default and highly interventionist policies) by cutting energy subsidies, abolishing export taxes, lifting capital and currency controls and floating the (overvalued) Argentinian peso. In early 2016 Argentina negotiated a debt deal with the remaining holdout creditors, which enabled the country to exit default and return to international capital markets. This has comprehensively improved the economic relationships with the IMF, the US and Europe. While the governing coalition gained additional seats in the October 2017 mid-term legislative elections it still lacks a majority in both the Chamber of Deputies and the Senate. This means that President Macri has to cooperate with the opposition in order to obtain parliamentary majorities for reforms. The economy rebounded in 2017, and structural reform progress should support faster and broader based growth in 2018 and 2019, driven by investments, exports and consumer demand. Access to capital markets by central and local governments and Argentine businesses remains solid. 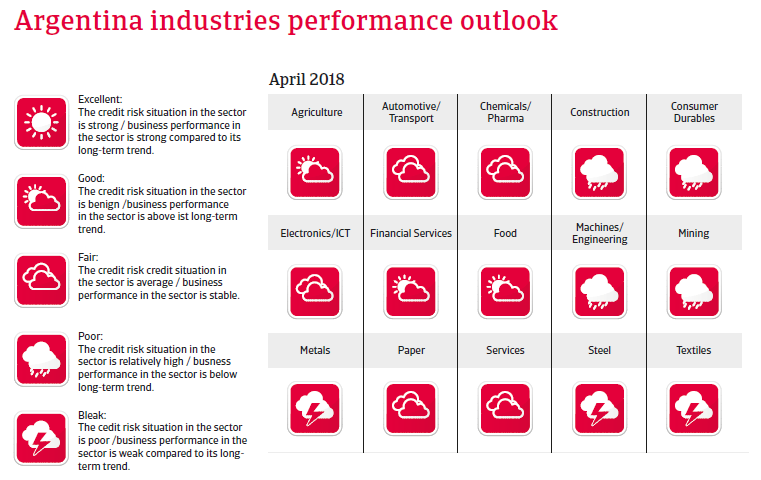 While the return to more market-friendly policies has improved Argentina´s medium- and long-term growth prospects, the short-term outlook remains challenging, and significant downside risks remain. 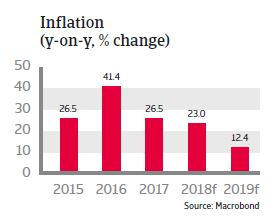 Despite a major decrease in 2017 inflation is not expected to reach single digit levels until the end of 2019, as the disinflation process faces challenges from expansive fiscal policy as well as difficult wage negotiations in the effort to scale back indexation. More efforts to trim the fiscal deficit are necessary to make the economic recovery more robust, help the disinflation process, stimulate foreign direct investment and strengthen official currency reserves. 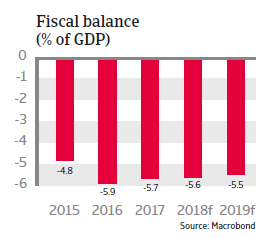 Due to political considerations (potential social unrests and the fact that the governing coalition has no majority in Congress) fiscal tightening is expected to remain only gradual, and fiscal deficits to remain above 5% of GDP in 2018 and 2019, with government debt rising further. The debt structure is becoming increasingly risky (73% financed externally in foreign currency) making government finances vulnerable to exchange and refinancing risks. The rebound of domestic demand with higher imports (mainly capital goods following the removal of capital controls) has resulted in rising current account deficits, which are mainly financed by portfolio inflows. So far, such financing has not been a problem, but Argentina remains vulnerable to shifts in market sentiment. Although liquidity has improved following the issuance of international bonds, it remains tight and is insufficient to cover gross external financing needs. This will keep the peso susceptible to shifts in market sentiment, and the exchange rate is expected to gradually depreciate further in 2018. Structurally Argentina´s economy remains vulnerable due to its high dependence on commodities (agricultural products account for 50% of exports), a relatively high stock of inward portfolio capital, weak institutions, the issue of government finances and its history of debt default. 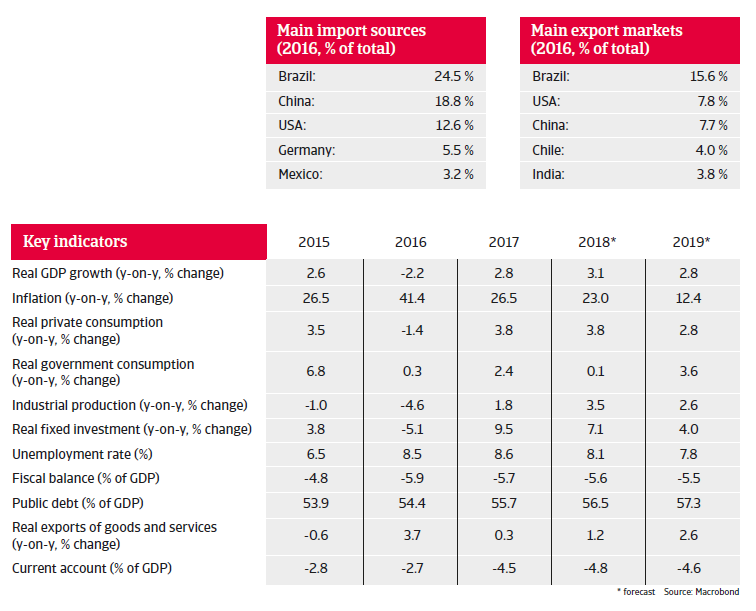 The current upswing could be severely dampened by additional US import tariffs and any disruptions in global trade flows. Many long-standing retail chains are highly indebted, often from leveraged buyouts led by private equity firms, while investors reconsider further lending.